The Vision of the Miss Africa USA Pageant is driven by the potential and capacity of the empowered African woman, she is a leader, she is ambitious and she is very savvy, ready to take on responsibilities and focused on changing the world around her. Project a positive image of Africa to the rest of the world . Bridge the gap between Africa and the United States through gestures of goodwill between the two continents. 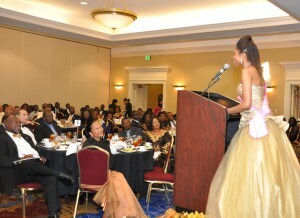 The Mission of Miss Africa USA Pageant is to empower young women through Leadership and Community Service.